Contact us today to find out more about MYOB BankLink. When you're running your own business, it's important to keep your mind on the job. You don't want to waste time crunching the numbers and completing your bookwork when you could be spending that time on your business. 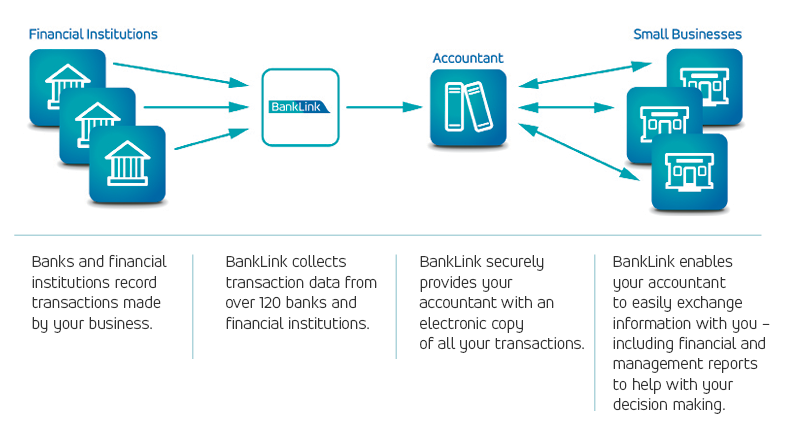 We use MYOB BankLink because it has a range of simple solutions that let you easily provide us with the information we need. It means you can stay focused on building your business. The MYOB BankLink Service automates and simplifies your accounting by virtually eliminating manual data entry and the collection of receipts and bank statements. You'll no longer have to spend hours doing your books with software that is often complex and expensive to use. MYOB BankLink makes it easy for us to send you regular financial information so you can make well-informed business decisions. Join more than 320,000 business owners who have already discovered that MYOB BankLink makes their accounting a lot easier. MYOB BankLink is completely secure and has achieved PCI DSS (Payment Card Industry Data Security Standard) compliancy - a security standard set by the major credit card companies. You do not disclose your bank passwords at any time and the service does not have any internet banking capabilities. Electronic copies of your bank statement transactions are sent to us under strict international security measures, in accordance with the requirements of all the major banks. Your transaction data is supplied in encrypted form and cannot be accessed by anyone other than us. We cannot register you with The MYOB BankLink Service until you have provided a signed authority form.